I'm sure you everyone out there is shocked to know that as much as I love the Oscars (the results of which can be found here) and more or less everything that comes with it (including my paycheck, of course), the show itself is something that I think could stand to be improved in many ways. Yes, the Oscar telecast can more often than not leave something to be desired, regardless of who you are, even if everyone involved in the production of the show always has their hearts in the right place. Some years we have better shows than others, with the same going for the winners for that matter, but I can't ever remember watching the telecast and thinking that they absolutely nailed it, and I know I'm not alone in thinking this way. In an effort to help the Academy have the best awards show that they can possibly have, I've come up with some possible suggestions that might just improve Oscar night. It would potentially turn the show into one that appeals both to die-hard Oscar nuts like myself and the casual viewer as well, the one who watches as much as anything in order to have something to say around the water cooler the next day. In a perfect world, everyone would be equally pleased with the Super Bowl of film (as it is known in the television world). Some of the changes I'm proposing have to do with making the nominees/winners slightly more satisfying than they sometimes are, while others have to do with just the televised ceremony itself and the production thereof. The goal here is to keep the Oscars feeling like the Oscars for those among us who truly love them, but to do so in a manner that would be perhaps more pleasing to everyone. I've got five specific ideas in mind, and I'll share them with you all now. For a recap of this year's show, see Ethan's video breakdown. Suggestion number one involves the Best Picture lineup. A total of nine nominees just seems odd to me, so I'd propose either going back to a firm five or ten. I'm far more in favor of the latter since I like the expanded lineup, but we really gain nothing from the supposed suspense about how many nominees the category will have. The math suggests that ten is almost impossible and only a very specific sort of year will invoke the lower numbers, so we're basically locked into eight or nine nominees each year (both years with this sliding scale we've had nine nominees, in case you didn't know), and that's not very satisfying to me. Plus, if we had a mandatory ten this year, we might have seen Inside Llewyn Davis make it in (though more likely Woody Allen's Blue Jasmine would have taken the final slot) to the lineup. Next, I'd keep something that the producers of the show seemed to be trying out this year, and that's not playing off the winners while they're giving their acceptance speeches. By and large, the speeches were better than usual (you can see the best of them here), and I think at least in part it had to do with not having to worry about the music drowning out their conclusion. Yes, some merely thanked a ton of folks, but that was lighter than in previous years, so please keep this up! Suggestion number three is that I'd like something more for the segment honoring the deceased. Every show does a montage, but this is the Academy Awards, so can't a little something extra be done? I don't have anything too specific in mind, but perhaps some of their friends could talk a bit about them too? Bill Murray made sure to make mention of Harold Ramis when he was up as a presenter, so having him say a few words in addition to the aforementioned montage could add a touch of class to things. It might add a little time to the show, but they always go over anyway, so would this really matter all that much in the end? Another suggestion of mine centers around effectively integrating the Oscar host. Lately, the host mainly is there for the opening monologue, and it can be awkward after that for them, and all of us too. Instead of eliminating the host altogether, as some have suggested in prior years when the host didn't blow anyone away, I think finding an appropriate fit for the year's theme will exhibit a better overall show. As a recent example, I actually think that Seth MacFarlane turned out to be a pretty good choice two years ago for a telecast that factored in music heavily, even if he wasn't the best host. By the same token Ellen DeGeneres probably did better on the whole than he did but she didn't fit the theme the show was going for. A final suggestion is to time the show better on the whole. I hate how most years we have to rush through the final categories, when that's what we've all been waiting hours to see. It makes no sense to me that the least care is given to the Actor, Actress, Director & Picture categories. Those should be the ones with almost a whole show to themselves, right? Maybe I notice this more than most, but I do, and it bugs me a lot. They always run long, so embrace the epic nature of Hollywood's biggest night! Go all out with these ones! Overall, there's really nothing out there that would stop me from ever watching the Oscar telecast like a hawk, so these are more loving suggestions than anything else. 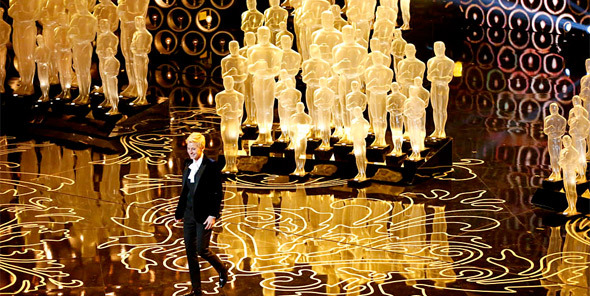 Last year we ran ways to Improve the Oscars for Cinephiles & General Audiences. That being said, the show could always stand to try and better itself. I have some serious doubts that it'll ever be anything close to an ideal ceremony, but that doesn't mean that the effort can't still be made on the part of perfection, right? Regardless, these are my humble suggestions and I'm sure you all have your own, so why here's a great place to discuss them. Have at it! Thoughts? Honestly, I have no dog in this fight. They can keep doing what they do for all car. Presentation is way behind in importance than actual awards themselves. I personally hate the idea of ten nominees. When The Blind Side can get a best picture nomination, and its only other nomination is in Best Actress, it's not truly a best picture contender. Best picture nominees with 2 overall nominations is pointless. It all depends. It's not like with five we've never seen Best Picture nominees that are barely recognized elsewhere. I agree that the big categories get the rush because of time. That being said, do we need film montages throughout the show? Maybe one plus the in memoriam piece. Why the song after that? Do it during. There, I saved maybe 10 minutes to start. That's a very different issue though. It's their organization, not ours, so it's not like we have a say in who votes. Make it two nights of for the ceremony. Just put the supporting actors on day 1 so people will still tune in. Then day 2 for the docs, shorts, and leads. Obviously cut out all the worthless montages. Theme is heroes? LAME. Animation montage? Only 1 foreign film showcased, but I saw Kung Fu Panda at least 4 times. FAIL. And please, for the love of god, 5 nominations minimum. If best film can have 10 why only 3 for makeup and a few others. That's just sad. I'd rather five for every category except picture, which would get ten. How to improve the oscars? Have John Travolta announce every winner. Oh, I've complained about that one for a while now. It's so strange to me that studios themselves aren't behind this, since with two extra spots there we likely would have had two more nominations for 12 Years a Slave and American Hustle. Have Jimmy Fallon host it and make it mandatory to have at least 5 of his skits (sure, some might bomb, but even those will be better than what we have now). If someone has something important to say, don't drown 'em out with silly music. Instead, start fading out the mic... they'll realize they're going to be cut off, so give them a chance to wrap it up quickly... don't cut them off entirely unless they don't get the message. Maybe have realtime feedback (through online voting(? ), Twitter(?)) so the host will know if he/she's losing the audience. My .02c. Move the Oscars to early february, by the time this award comes, all other guilds and awards have taken the "mystery" out of the Oscar nominees. Avoid the "Theme" like "musicals" or "heroes", both years have failed making this themes relevant, your theme should be "the Oscars" period. Last year I would have preferred to see all the James Bond actors than two of the songs and this year the "heroes" thing made no sense Like you say, it's either 5 or 10 nominees, this year was amazing for cinema, Blue Jasmine, Rush, Prisoners, Saving Mr. Banks or Inside Llewyn Davis could have been the tenth spot and Nebraska was not worthy of a Best Picture recognition. The top for awards should be presented by last years winners, WTF was Will Smith doing presenting the Best Picture Award instead of Ben Affleck WHO WAS THERE!!! The host's opening should last no more than 8-10 minutes, Ellen was a great host but her monologue lack punch and last years boring 15 minute opening killed the first 30 minutes of the ceremony (also, make it illegal for Seth to set foot anywhere near the Oscars!) Neil Patrick Harris, Jimmy Fallon or Hugh Jackman should host!! hell even Kevin Spacey or Jim Carrey If you put all the nominated songs on your show, make them a spectacle! This year you had Karen O, U2, Pharrel Williams and Idina Menzel (or was it Adeele Nazeen? IDK) and only the last two were a real show! and please...let the performers sing the entire damn song!! I have to disagree with the Neil Patrick Harris suggestion as he was horrible at the Emmys. But I love the Kevin Spacey suggestion! He was great at the Oscars this year. I never knew he could be so funny. Only if he did it as Frank Underwood. That would make my entire year. Completely agree with the orchestra not playing people off. That was a nice surprise this year. I get sometimes they have no choice when the winner just won't stop talking after five minutes, but it was really enjoyable not to see people get played off after barely one minute. I think they need to just cut the useless portions of the cermeony. Last year and this year was filled with them. Which makes sense since it was the same producers. But last year, they made it into the "Year of Musicals". How the hell was it a year of musicals? Just because one musical got nominated for Best Picture? If there was like four nominated musicals I could understand, but one? No. The producers just wanted to give themselves a pat on the back for being involved with Chicago and Dreamgirls. Having people sing songs from those two movies, as well as the Les Miserables cast perform was pointless and a huge time waster. This year they did it again with the hero montages. I don't even understand the point of them. I mean there was no point, but I can't think of one, tiny, justifiable reason that those montages were needed. Again, all they did was add on time. Overall though, I did enjoy these Oscars because it just seemed like everyone there was having a good time. A lot of people got involved with Ellen's bits, and it just made a big difference to me to see people really enjoying themselves as opposed just sitting in their seats for 3.5 hours staring ahead and fake laughing. Not playing people off is a major improvement in my book, for sure. Yeah.......stop choosing the wrong people to win awards, then maybe, just maybe more people will be interested in watching. Well, considering everyone has a different idea about who the "right" people are, I wouldn't count on that changing anytime soon.